Research shows that on average, a person hears between 20,000 and 30,000 words in a 24-hour period--and speaks about 7,000 words per day, with many people speaking much more than that. Add in the number of words we read each day that fill our newspaper, overflow our inbox, and flash across our phones, the number of words we consume daily is multitudinous. From reading the news of fires in California to reading and writing emails, from catching up with a friend over coffee to trying to get a Verizon bill corrected...We live in a world of words. “Here and there, in even the most dismal human drama, words can release the most exquisite pleasure, can shift our perception to unthought-of possibility, can so impact our lives so that we are never quite the same,” writes J. Randall Nichols in The Restoring Word, “Yet we also know that words can maim the human spirit, tear out tender shoots of hope, and tip us over into bottomless sorrow.” Words have power--for good and for ill. In the national political arena and even on our own church Facebook page, we have seen how words are used for ill--to insult and incite, to condemn and castigate, to discriminate and divide. The Bible is filled with words, but ironically, challenge us to use less words for good. The wisdom of the Bible is that less words are often more; and that a time of silence is not wasted, but in fact has great worth in its power to bring deep healing and hopefulness. If you have been out shopping lately, you have no doubt already heard the words of Christmas songs filling the stores. You have heard the words of the advertisements trying to get us to buy more stuff. The pace is fast and it will only get faster as the countdown to Christmas is on. Extended hours...Perfect gift...Come in and save...Sales, Sales, and more Sales….We live in a world of words. And yet in the church, as we enter the season of Advent, we are invited to a time of less words and more watching and waiting, less running and more reflection and renewal, less preparation and more prayer and peace, less stress and more stillness and silence, less mayhem and more mindful meditation on the great mystery of the Word of God that became flesh and lived among us, full of grace and truth. This Advent we will focus on just four words: Hope, Peace, Joy, and Love. 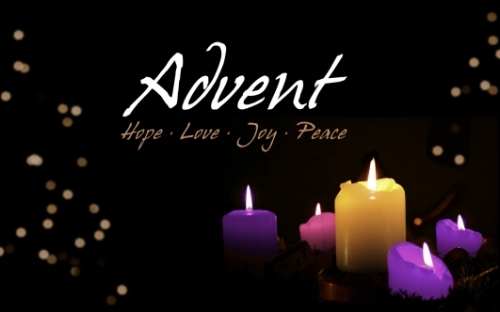 One word for each Sunday of Advent will guide our worship. I invite you to make some time each day of Advent--even if just 5 minutes--to sit silently, take a deep breath, focus on the one word of the week, and listen, allowing God to speak to you in the silence. At the end of Advent, we will gather together on Christmas Eve, to hear the story of the birth of Jesus Christ, when the Word became flesh. We will hear words of promise, speak words of prayer, and sing words of praise. And at the end of the night, we will sing the most famous Christmas carol, which has rung out around the world for two hundred years. In what I consider to be the most profound moment of worship, we hold up our candles and unite our voices in the words: “Silent night, holy night, all is calm, all is bright...Sleep in heavenly peace. Sleep in heavenly peace.” And then, in the beauty of the candlelight, a peaceful silence settles in the church, and in all of our hearts, and even around the world, and speaks more powerfully than any words could ever do.